How many of you consider yourself to be a super fan of something? Star Wars? Star Trek? Marvel? I remember growing up with comic books because my father would take me to bookstores and comics were inexpensive... I loved them. But I never considered myself a super fan... or part of a fandom... but thing is, I am so a superfan of stories... fairy tales, and all that "geeky" stuff... even if I've never considered going to any kind of comic-con. 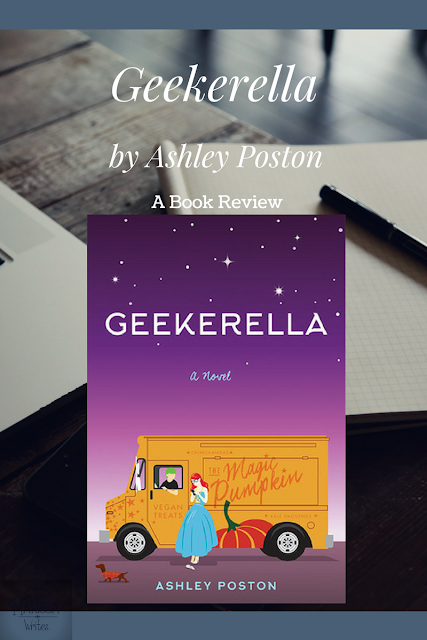 You see, I know I am a crazy superfan, because Ashley Poston's new book, Geekerella, jumped out at me, and hooked me in its adorably geeky fandom story. Danielle, or Elle, is a super fan of Starfield because her father was a super fan, and after he died, it was a way to hold on the good memories. Elle's home life is anything but fun, with a stepmother who is too focused on societal standing for her and her two biological daughters. Elle has become little more than a servant in her own home. But she escapes by writing a fan blog about Starfield. When an amazing prize is announced for the Annual Exceliscon Cosplay Ball in anticipation of a reboot of Starfield, Elle makes a grand plan to enter. Along the way, she finds out what friendship means, and love, and family. Darien Freeman is just an average guy, hoping to one day have a life again... because he's also a super famous actor that girls drool over. He has accepted his life will consist of two versions of himself - the on-camera Darien, and the nerd Darien who would rather play video games and watch Starfield most afternoons. When he lands his dream role as Starfield's lead, Federation Prince Carmindor he hopes this will make all the hard work worth it. But he quickly learns his fan base might not mix with the Starfield fans and begins an upward battle to prove he can be the perfect Carmindor. Alright, guys, this is such a fun light-hearted plot, it's the perfect summer read. Sure it's another Cinderella remake- no one is hiding that fact. So you know the ending... but books are about the journey sometimes too... and this is such a fun journey you will love it. I loved how real the characters are. Elle is a normal girl, even with her odd family set up. She has a job, she has school, and she has dreams for something more in the future. Darien might be this super famous actor, but he still wants to know he's accepted by the people close to him for being him, and not something fake. Another reason to pick this is up is that it is current - there are one-liners and jokes for fans of all big TV shows, movies, fandoms, etc from the last 30 years or so. There are hints and nods to so many greats you will want to pick this up just for the Easter Egg search. I don't really have many complaints, mostly because this is a fun book. I would probably call it YA Humor more than anything else. But since I want to be honest, I would have liked a little more development of the Ball build up the scene... without giving away spoilers... Darien's friend confused me, and then just seemed to be a plot driver and not actually a character... which is disappointing when the other characters are all so outstanding. I'm giving this a four heart rating - it was great. It was fun. I am just not sure it is a reread for an adult - this is clearly a YA book - and for that it's great. As I mentioned, this is a YA novel. So the suggested audience would be 13-17, and I think that's perfect. In fact, I am sure there are many 12-year-olds who would get a kick out of this. While there are plenty of "older" fandoms mentioned in the book, with the popularity of Netflix and YouTube bringing back all the older sitcoms and movies, most teens will get the jokes. There are not many issues to be aware of in this as far as parents should be concerned over - It's a Cinderella story. There are "evil" stepfamily members, there's rule breaking... there is gossip, and bullying... just as you would expect in a Cinderella story. But there isn't a ton of adult issues. As far as adult readers, go for it! 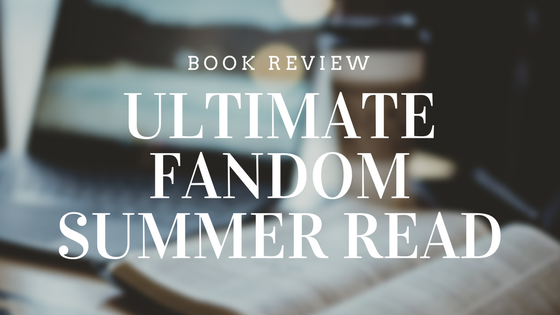 Summer is for fun reads, and this is a super fun one. Most readers could fly through this in a week getaway. And besides who wouldn't want to carry such a cute book around?? 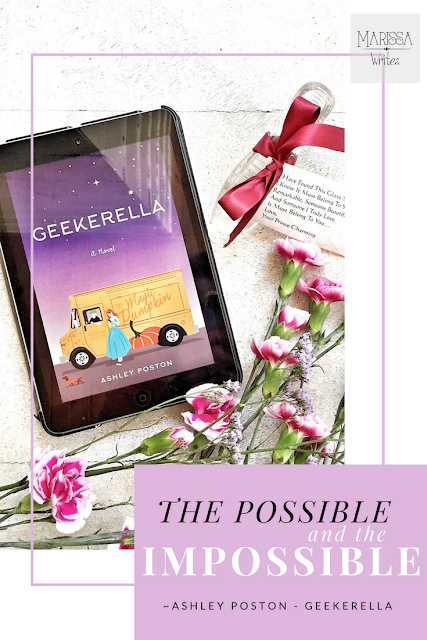 The joy of Cinderella retellings is the focus on the underdog working up and overcoming some kind of bully or injustice. Let's be honest here, we can say the PC statements about no tolerance or whatever is in vogue right now, but bullying happens all the time. Stories like these help teens learn how to persevere and find their own paths. They help readers know that while it might feel like the end of the world, most situations are temporary and there are solutions or other paths. Now before everyone starts hitting me with the points about bullying, I know it's a serious problem. But fiction is the perfect place to start conversations... and nerds need outlets... because most parents used to be nerds too. 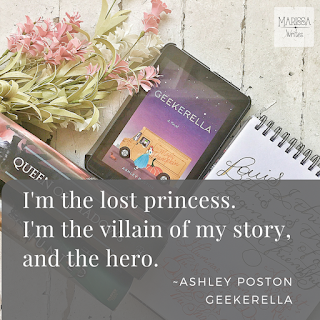 Do you love fairy tale retellings? What is your favorite version of Cinderella? Would you consider yourself a superfan of some fandom? Oooh, this one looks like a lot of fun! I think there are several in my house - myself included - who would enjoy this one! Thanks for sharing this at Booknificent Thursday on Mommynificent.com this week! This was a fun story - probably for upper middle grade to low YA reading levels as far as topic and structure, but still a fun summer read!